Fortune depantsed longtime rival Forbes today with a story detailing the business magazine’s finances, which have been terrible. Don’t worry about it, Forbes chairman Steve Forbes tells his staff, via an internal memo which you can read below. Before we go further: I worked at Forbes for 10 years; I still know lots of folks who work there. Now: The Fortune piece is useful because it details, via internal documents from banker J.P. Morgan, just how badly the bet that Elevation Partners placed on the magazine in 2006 has worked out. The fact that Elevation (better known as either Roger McNamee’s private equity fund, or Bono’s private equity fund) bought a minority stake in the publisher at close to the market peak has been well known. But the Fortune piece spells out just how badly timed it was: Elevation’s projections had Forbes generating close to $90 million in EBITDA in 2009; instead, the company had operating losses of $19.7 million. Last year the company went into default on a $90 million credit line. Fortune also argues that the deal has been a disaster for the Forbes family, but I’m not sure that this is the case. After all, it allowed them to take more than $100 million out of the company while holding on to a majority stake. If they hadn’t done that five years ago, they certainly couldn’t do so today. Regardless, Fortune does a good job of showing just how precarious life has been at Forbes for the past couple years — as it has been at every business magazine (just ask Portfolio and BusinessWeek) — and the publisher’s uncertain future. Elevation and Forbes have interlocking put and call options that kick in next month, and it will be interesting to see how long Elevation remains a minority owner. Today Fortune magazine published a story on Forbes with the clear intention of disrupting the business of its most formidable competitor. Fortune was aware that this was highly confidential, private information and of no value to release to the public. Though the intention is to harm our business, it will not adversely impact Forbes because it highlights a very difficult time in the past when all the media industry was going through unprecedented upheaval. Forbes has the finest team – you – in the media world today. Forbes is profitable and is successfully navigating these extraordinarily turbulent seas. The company continues to grow and thrive with powerful new strategies and talent. We are attaching (below) a statement that will be sent later today to the media responding to this article. Forbes Media is profitable and in full compliance with all bank loan covenants. by the board of Forbes Media upon the recommendation of management. In 2008, Steve Forbes and Tim Forbes, CEO and COO repectively, initiated a reorganization of the company, including the integration of its independent operating units, Forbes magazine and Forbes.com. They also decided to expand the company management team, which led to the successful recruitment first of Lewis D’Vorkin as Chief Product Officer and then Mike Perlis as CEO of the integrated business. The last decade has seen unprecedented upheaval across the media industry.Within that decade Forbes magazine, uniquely among its largest competitors, Fortune and Business Week, grew its total readership to record levels – 5.4 million in 2010 – and grew its share of advertising from 33% to 40%. The company also launched 16 local language editions, giving it the largest worldwide brand footprint among business publishers. At the same time, Forbes.com grew to one of the largest and most profitable business websites in the world, with, on average, 20 million monthly unique visitors. Since 2010, the company has pursued its strategy of putting journalism at the center of social media. This strategy is at the cutting edge of media today, which is why it is garnering support from audiences and advertisers alike. Elevation Partners are enthusiastic supporters of the direction of the company and have been full participants as these strategies have been developed. Steve Forbes remains Editor in Chief and Chairman of Forbes Media. Tim Forbes is Chairman of Forbes Digital. 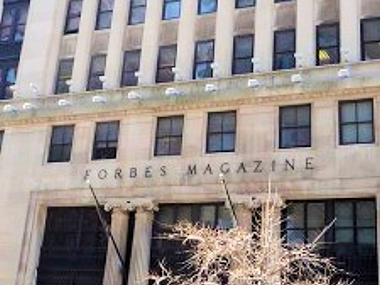 The Forbes family remains the controlling shareholder of Forbes Media.